With the first month of 2017 coming to an end, tech teams across the world are busy planning their approach for what’s remaining of the year and beyond. While some of the most obvious topics of discussions among IT professionals include which projects to prioritize and how to efficiently use the budget, discussions on which software development practices to put to use form an equally important part of the organization’s strategy. Over the past decade or so, such discussions have always surrounded around Agile development processes. 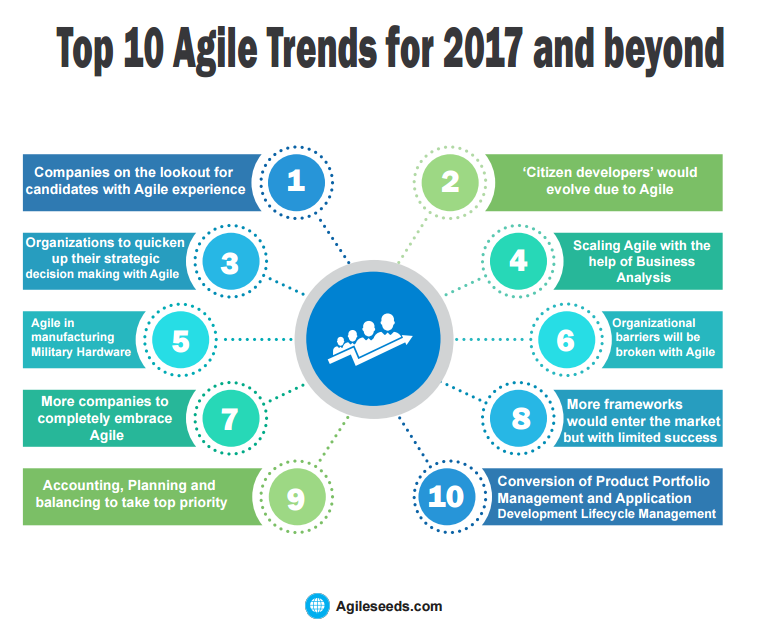 With Agile’s popularity and applicability increasing with every passing year, it would be worth having a look at the top 10 Agile trends for 2017 and beyond and align our strategies accordingly. About to hit its 20th anniversary, Agile development has truly come into its own and become a mainstream development model adopted by organizations of varying sizes. 2017 would be no different. Experts believe that companies would aggressively look for candidates who possess prior experience on projects using Agile or in Agile offices in order to readily induct them in ongoing projects. So if you are an Agile experienced professional, get ready for a year of great opportunities and progress. Methodologies such as Agile and DevOps have transformed the software development process and made it faster and more efficient. Growth in Agile has also led to the evolution of ‘citizen developers’, i.e. the employees which are working beyond any orthodox IT role and making use of RAD (Rapid Application Development) environments to come up with software applications for fulfilling certain business needs. A faster turnaround time has always been desirable in the IT industry. Agile seems to be making it possible now. Employees working in various departments of the organization would have access to automated research tools along with rapid application development (RAD), thus enabling them to undertake swift tests. Results of any strategy or process would be quickly available and can be assessed readily. This would empower the employees to come up with accurate business decisions and drive it towards profit. While Agile has impressed one and all with its results, its application on projects which are large and complex or are running at an enterprise wide level still remains a complex task. One of the reasons is the prevailing doubts about the best framework for the purpose of scaling Agile. There is widespread agreement that integration, coordination and agreement among the different Agile teams is the key to Agile expansion. With an increasing understanding, the year 2017 is expected to be the year when the Agile methodology is adopted at the enterprise level. Manufacturing of advanced military systems requires some of the most sophisticated technology to work in complete coherence with the human mind. It involves highly expensive research, complex designing and mammoth manufacturing related challenges at all levels. In order to control the costs without compromising on the desired quality, manufacturing companies are turning towards Agile processes. This has led to lower costs without any dip in the quality. Apart from military manufacturing, a number of other non-IT sectors are increasingly adopting Agile to ensure efficient development processes. Some of them include car production, real estate construction, architecture, finance and even education. Agile tools such as workflow tracking, story mapping and analytics and Scrum boards and activity streams are increasingly finding heavy application in non-IT industries. This trend is only expected to spread wider in 2017. The year 2017 will see Agile delivery mechanisms, which help firms to expand new customer experiences, becoming a norm across organizations of all sizes. Cross functional teams would be aligned keeping customer experience in mind. The emergence of such teams would make the businesses even more efficient in terms of operation and the attached costs. Professionals working in the digital business would look to champion the Agile teams to fulfil different tasks, including manufacturing and rolling out of new products, sub-journeys of the customers and varied digital experiences. This overhaul might need certain new models for leadership and new tools for collaboration. In order to keep everyone on the same page, insights tools would also be employed on a large scale. A number of reports have found out that out of the teams that claim to be using agile testing process, many are actually using ‘fast waterfall’ method. In fact, most of the Fortune 1000 companies have been averse to adopting Agile IT transformation; but that is expected to change by the time 2017 ends. Finance departments of many of these companies are expected to come around and take up capitalization of software on the basis of Agile development mechanism. The claim of being able to develop outstanding software won’t be realized unless the organization embraces Agile development processes. The organizations would realize that path to the top goes through Agile development. A number of new scaled Agile development frameworks are expected to arrive into the market, albeit with limited success. While Scaled Agile Framework expands its market share, other prevailing methods would either contract or barely hold on to theirs. While SAFe is the undisputed leader, companies could choose from a number of other frameworks as well, such as Nexus, LESS, DAD and Kanban. Though there is hardly any organization that can claim 100% implementation of the SAFE, a number of highly successful companies are now moulding their existing framework to work with their business using a common platform offered by SAFe. With the continued contraction of PPM space, all the large scale frameworks are expected to take up cross portfolio planning, portfolio balancing and bimodal accounting. The progression of Agile at Scale has now reached the portfolio level and is about to go beyond. Some of the emerging challenges include ensuring satisfaction of auditors and adhering to corporate governance. Many companies withdraw from transformation since they are not sure about how to integrate skill set based utilization planning along with agile teams. The organizations are expected to work on these lacunae in 2017. As business agility assumes a more prominent role, the year 2017 would witness PPM and ADLM converging and orthodox PMO becoming obsolete. Investing in a comprehensive PPM solution is becoming increasingly unaffordable and undesirable for the companies. For the thousands of dollars spent on PPM solutions, the companies are hardly making use of this platform for holistic portfolio planning. This would result in a major shift towards ADLM solutions this year which would prove to be a much more cost effective. Having firmly established itself as the preferred development mechanism for companies of all sizes and working in all areas, 2017 promises to be a watershed year for Agile development processes. The two decade old technology promises to revolutionize the IT and touch upon many other sectors in 2017 and the years to come.